The Amish Economy Computer Desk equips your office space with a stylish work station that's ready to support daily tasks with ease. This wood desk features plywood panel sides, a plywood back, 2 adjustable plywood shelves, a keyboard pullout, 3 drawers on full extension slides and wood knobs. Begin your workday at an attractive desk with room for your computer set up, shelving for books and manuals and drawer space to house your office essentials. The superb craftsmanship and fine detail of this Amish Computer Desk is sure to enhance your office decor. 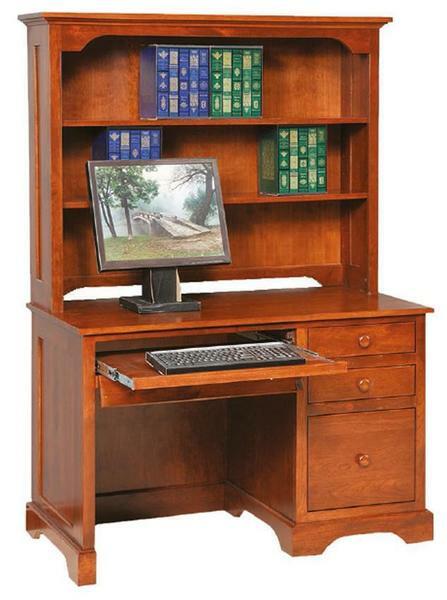 This Amish made desk is designed and built by skilled Amish woodworkers with unmatched craftsmanship. Be sure to browse our collection of Desk Chairs to find the perfect fit for this computer desk. This wood desk is 48" wide and 24" deep. Select the wood and finish you like best from a variety of options. Email or call us today or stop in at the DutchCrafters Furniture Store in Sarasota, Florida to experience Amish furniture in person. Our toll-free number is 866-272-6773.